The Pilstyes Cottage – suitable for a Honeymoon, special occasion or for discerning people who demand a higher standard of accommodation than is normally available for renting – is decorated and fitted to a high standard, retaining an olde worlde atmosphere of a bygone age. The living room (double aspect overlooking both the High Street and courtyard at the rear of the property) has a heavily oak timbered ceiling. Walk-in cupboard for coats, shoes, ironing board and vacuum cleaner. Comfortable chairs, table and four dining room chairs and a flat screen TV, with freeview and DVD player with an assortment of DVDs. 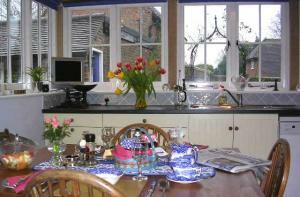 The kitchen (overlooking the rear of the cottage) includes sink, oven and hob, microwave, fridge and dishwasher. 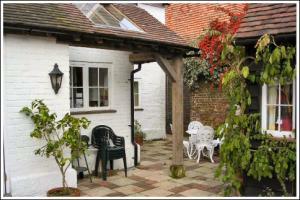 There is also a washing machine and tumble drier ouside in the courtyard area. All cutlery and crockery, pots and pans are in a new condition and are of an excellent quality as you will see from Photo 4. There is sufficient for six place settings. The small courtyard area for your private use. There are garden chairs and a table and a gas bbq. Stairs lead up to the first floor, which includes a 4-Poster double bedded room (the Elizabethan Room – Photo 5) and a bathroom with toilet, wash basin, bath with Aqualisa shower and heated towel rail. Again exposed ceiling beams and wall timbers create a wonderful atmosphere. Stairs lead up to the second floor twin bedded room (Eliza’s Room) which has a low pitched ceiling with exposed oak beams and is divided by two ancient V-shaped oak timbers. This room is not suitable for the physically challenged. All the rooms in our cottage are very clean, comfortable and prettily decorated in keeping with the period of the house. Each bedroom is equipped with a hairdryer and clock radio. All beds are of good quality and new condition. It has comprehensive fire precautions plus a security system. It has fully fitted carpets throughout. There is full central heating and constant hot water. Excellent quality bedding and fluffy towels are provided. There is a land line telephone in the cottage which receives incoming a calls. If you wish the bar can be removed and you just pay for the calls you make. There is also wifi in the cottage. The cottage is not suitable for toddlers as it is not possible to fit stair guards, etc.